Dover is an important city found in the South East England and this town faces the strait of Dover. There is the Dover Calais ferry which is found across the Port of Dover. The Port of Dover is very famous and is a cross channel port which is situated in Dover, Kent. This is the nearest English port found to France and is one of the world’s busiest passenger ports with over 16 million travellers annually and an annual turnover of £58.5 million a year. This historical city has many things to be seen and is of natural beauty. The White Cliffs of Dover is famous and it is the region which is found in the English coastline facing the Strait of Dover and France. The cliff takes its white colour from the limestone deposits and the formation of chalk against the streaks of black flint. 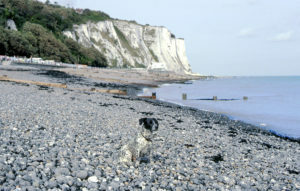 These cliffs extend on both sides of the town of Dover in Kent and has a stretch of 8km . The cliffs open to the beach area. As these cliffs have well preserved fossils, individuals who show interest in fossil collection can find a lot of enthusiasm in the area and discover many fragments of cocoliths and other sea creatures which has been formed since the Cretaceous period. The deposits of the organisms has caused sedimentation and consolidation into chalk. As historical evidence the city has an iron age hillfort close to the later castle. This area was inhabited during the Roman period when Dover became famous as a port. A Roman light house is found which is the tallest structure found in England built during the Roman times. This light house helped the people to navigate the port. Also archaeologists have been able to find a Saxon cemetery and the church of St. Mary in Castro which is found near the lighthouse. Visitors could also take a glimpse of the Dover Castle which is the largest castle in England and it has been described as the ‘Key to England’ as it played a defensive role throughout history. This castle was made by the famous William the Conqueror in 1066 and latter stages saw its expansion by Henry II to its size as of today. This castle has a lot of importance as it has a lot of heavy artillery for capturing ports needed for warfare. Thus, the city of Dover has many unique attractions for the visitor.